I recently shared on Instagram that I was making some herbal extracts and many of you expressed that you’d love to learn how, too! Rest assured, it is ridiculously easy to make herbal tinctures and extracts, and will save you tons of money in the long run. What are herbal tinctures and extracts? Until recently, I thought they were basically the same thing, but my herbalist friend told me there is actually a difference. While tinctures are made using 1 part herbs to 3 parts alcohol, extracts are 1:1, making them stronger, and, in my experience, more effective. To make herbal extracts and tinctures, you’ll need herbs and a strong grain alcohol; I like to use pure, gluten-free 80 proof vodka. For the herbs, you can use any combination you want, in any amount you want. Recently, when I decided to make herbal extracts, I had my hubby bring me a 2 liter jug of vodka, which was enough to make just over 2 quarts of extract, which I divided into two glass quart jars. I had collected a few bags of dried herbs, including horehound, which I combined with elderberries and a little echinacea for a cough tincture; as well as a cystitis tincture with juniper berriers, uva ursi, sarsaparilla, and marshmallow root. I use extracts and tinctures all the time, as they are my favorite way to treat any illness in our home. I wrote about how we used oregano leaf extract and another for parasites to heal my son from symptoms of PANDAS (a behavioral disorder in children caused by strep bacteria), and soon, I’ll share with you my winning herbal combo for helping me sleep. As noted, you’ll need two things: dried herbs and alcohol, plus a jar with a lid to store them. Measure out your herbs and decide if you plan to make an extract or a tincture. Place the herbs in the jar, then fill with the appropriate amount of alcohol. For a quart of extract, I used two cups total of herbs, then filled the jar with another two cups of alcohol. 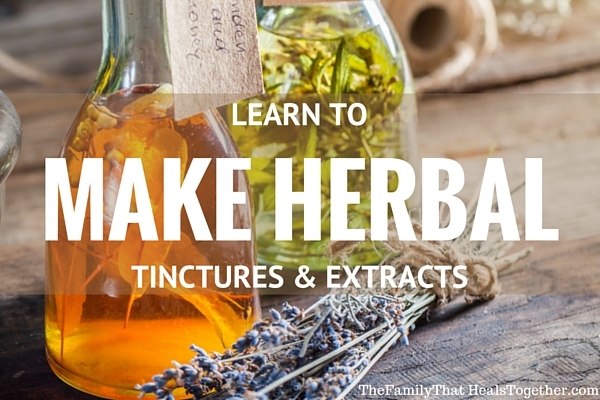 If you want to make a tincture, use 1 cup of herbs and 3 cups of alcohol. Once you have filled the jar, seal the lid tightly and place in a cool, dark place for 2-6 weeks. Make sure to give your jar a shake every day. After 2-6 weeks (personally, I like to let it go on the longer side for greater potency, but have been told that beyond 6 weeks, the potency does not change), use a fine mesh strainer to strain out the herbs as you pour the tincture or extract into a clean jar. That’s it! You can transfer your extract into a clean dropper bottle for ease of use and dosing. I typically take a dropper full of tincture for myself (20-40 drops), and give the kids lesser amounts based on their weight, from about 6, up to 20 drops. I just put the medicine in a little water and drink it. Personally, I don’t have a problem giving my kids alcohol-based extracts, but some people prefer to avoid alcohol for their kids. In this case, you can substitute vegetable glycerin for the alcohol. The result will be slightly sweet, and many kids don’t mind taking it at all. Why make herbal extracts yourself? #1- it saves a ton of money! Herbal extracts typically cost $10-20/oz! If you make them yourself, you will pay pennies per ounce. You can pick and choose herbs with the precise properties you need, like I did with my cystitis formula. Otherwise, sometimes you end up with ingredients that won’t personally benefit you. I get such a kick out of DIY-ing anything I can. When I first began experimenting with creating my own herbal medicines, a friend called me “Dr. Quinn, medicine woman.” I took it as a compliment! I just love having another tool for taking care of my family. 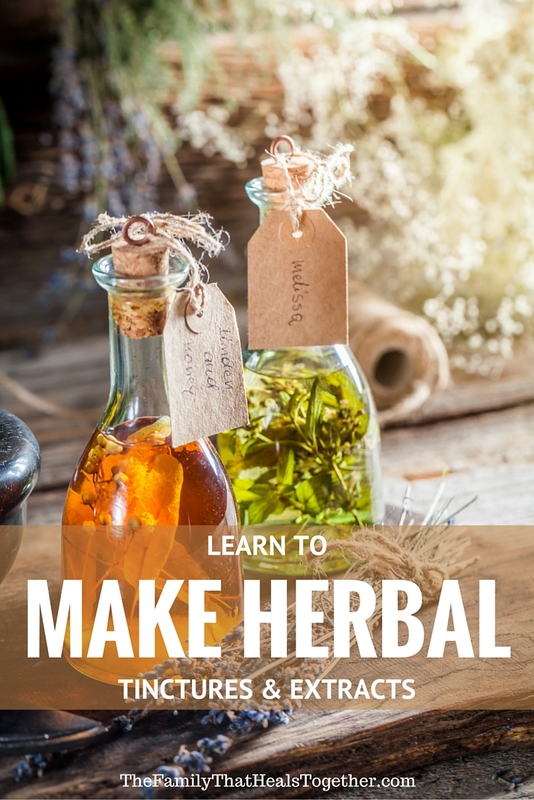 Do you make herbal remedies or would you like to learn more about it? Let me know in the comments, then be sure to share using one of our convenient buttons below!